© Wada et al. ; Licensee Bentham Open. In cementless total hip arthroplasty, imageless computer-assisted navigation is usually used to register the anterior pelvic plane (APP). The accuracy of this method is influenced by the subcutaneous tissues overlying the registration landmarks. On the other hand, the acetabular center axis (ACA) is determined from the acetabular rim. Precise registration of the ACA is possible because of direct palpation using a pointer. 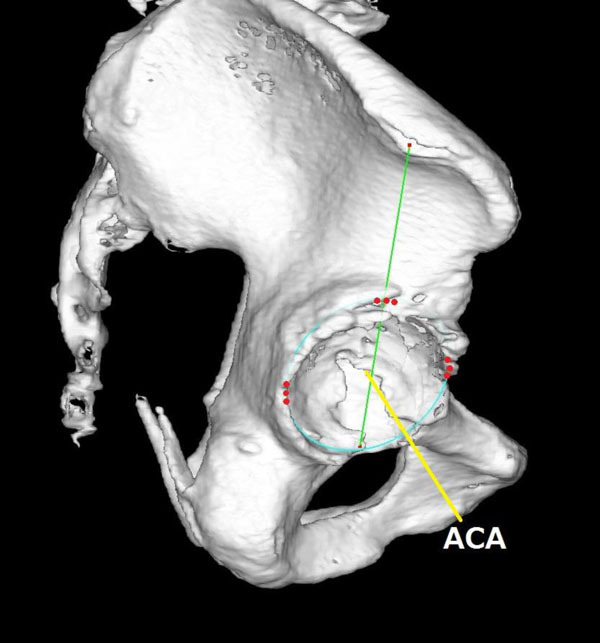 Imageless navigation using the ACA usually targets patients with normal acetabular morphology. The aim of this study was to investigate the accuracy of imageless navigation using the ACA instead of the APP in patients with normal or deformed acetabular rims. The intraoperative cup position was compared with that obtained from the postoperative computed tomography (CT) images in 18 cases. The inclination angle derived from the navigation system was 3.4 ± 5.3 degrees smaller and the anteversion angle was 1.4 ± 3.1 degrees larger than those derived from the CT images. The inclination cup angle of the navigation system was significantly inferior to the true value, particularly in cases with large anterior osteophytes. Keywords: Acetabular center axis, cementless total hip arthroplasty, computed tomography, developmental dysplasia of the hip, imageless navigation, osteophyte. Computer-assisted navigation systems have been used for cementless total hip arthroplasty (THA) to allow more precise placement of implants than can be obtained with traditional THA [1-4]. Some computer-assisted orthopedic navigation systems are based on computed tomography (CT) images. Others operate independently of preoperative imaging and are called imageless navigation systems. The accuracy of these imageless systems has been reported to be equal to that of CT-based systems [1, 5, 6]. Currently, the anterior pelvic plane (APP), based on the bilateral anterior superior iliac spines and the pubic tubercles, is usually used to identify the acetabular orientation in navigated THA. However, registering the opposite anterior superior iliac spine in the lateral position is difficult, and palpation of bony landmarks through the subcutaneous tissues is associated with considerable inaccuracy [7-12]. To address these concerns, a navigation system that registers the acetabular rim was developed [13, 14]. The acetabular center axis (ACA) is derived from the acetabular rim. The OrthoPilot imageless navigation system THA ACA® (B. Braun Aesculap, Tuttlingen, Germany) is based on the ACA and is independent of variations in pelvic anatomy; instead, it relies on readily accessible landmarks of the acetabulum. According to previous reports on imageless navigation systems, the main indication for surgery was primary osteoarthritis [1, 3, 9, 10, 15-17]. 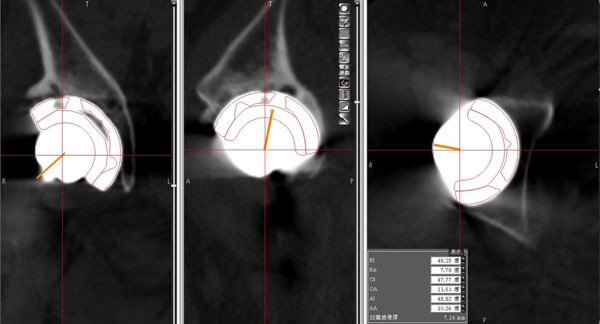 Although the target recipients of surgery using the THA ACA® are usually patients without degenerated acetabular rims, we have been using this software not only for patients with normal acetabulum but also for those with developmental dysplasia of the hip (DDH) and for those with osteophytes. The first aim of the present study was to investigate the influence of osteophytes on the acetabular morphology. The second aim was to measure the position of the cup in the postoperative CT image and to evaluate the accuracy of the imageless navigation system by comparing the intraoperative values for cup inclination and anteversion with the values shown on postoperative CT images from patients. We also examined the factors affecting system errors. The average was calculated from 3 points of each point (superior, anterior and posterior). The ACA plane was obtained from these 3 averaged points. The study was performed in accordance with the ethical standards of the 1964 Declaration of Helsinki as revised in 2000. Between May 2013 and August 2014, 22 patients at the University of Tsukuba Hospital underwent primary THA with the OrthoPilot THA ACA®. Four patients had to be excluded because of intraoperative dislodgement of the tacking pin. The patients comprised 2 men and 16 women; their mean age was 60.4 ± 12.6 years (range, 33 - 77), and the average BMI was 24.1 ± 4.5 kg/m2 (range, 18.1 - 31.8). The main indication for THA was secondary osteoarthritis due to acetabular dysplasia in 14 patients (78%), osteonecrosis in 2 patients (11%), rheumatoid arthritis in 1 patient (6%), and secondary osteoarthritis after femur fracture in 1 patient (6%). The surgical procedures were performed using the anterolateral approach in 14 patients, the direct lateral approach in 2 patients, and the posterolateral approach in 2 patients. We evaluated the acetabulum with X-ray images obtained from all patients preoperatively. All patients with DDH were classified as having Crowe group 1 dysplasia . The average acetabular roof angle was 13.3 ± 9.9° (range, -17.9 - 29.4); the average sharp angle, 42.5 ± 5.1°(range, 35.7 - 52.6); and the average acetabular depth-width ratio, 229.1 ± 61.9 (range, 136.8 - 390.5) . One hip was classified as having retroversion because of a crossover sign . Displayed values were based on the ACA coordinate system. In this case, the cup was adducted 16° and flexed 5°. All surgeries were done with the patient in the lateral position through minimally invasive surgery with press-fit components (Plasma cup®; B. Braun Aesculap) and cementless hydroxyapatite-coated stems (Excia®; B. Braun Aesculap). Two tracker pins were placed in the ala of the ilium and the acetabular rim was registered. The ACA was registered by palpating 3 points of the superior rim, 3 points of the most anterior rim, and 3 points of the most posterior rim. By palpating the iliac tubercle, a line was drawn from the iliac tubercle to the posterior ridge of the transverse ligament, thus crossing the superior rim of the acetabulum and allowing the superior point to be determined (Fig. 1). The ACA plane was defined as the plane including these points of the acetabular rim. And the ACA was orthogonal to the ACA plane. During the reaming procedure and after insertion of the cup, the angles of inclination and anteversion of the cup were measured Fig. (2) based on the ACA coordinate system. Our target acetabular component position was at an inclination of 40° . However, intraoperative deviations were accepted dependent on an adequate amount of bony coverage in each case. And the press-fit stability of the cup was accommodated. Moreover, the anteversion angle was adjusted according to the pelvic tilt shown on a radiograph of the patient in standing lateral position. We evaluated the perioperative complications, acetabular morphology with and without osteophytes, cup alignment after surgery, and accuracy of the THA ACA®. CT images with 1-mm slice thickness were obtained from patients before and 1 week after surgery. All measurements were done with the digital template software for THA (ZedHip®; LEXI, Tokyo, Japan). This software for reconstruction of a 3-dimensional model was described previously . Using this software, the angles are expressed automatically according to the 3 definitions described by Murray (operative, radiographic, and anatomic angles) , based on various coordinate systems. Acetabular angles measured with osteophytes were compared with those without osteophytes; the angles were based on the APP coordinate system. The radiographic inclination (RI) and radiographic anteversion (RA) of the acetabulum were measured according to Murray’s definitions. The postoperative cup angles were measured in the same way. The virtual implant model generated from the computer-aided design (CAD) data was aligned and fitted to the contour of the real prosthetic cup after surgery. 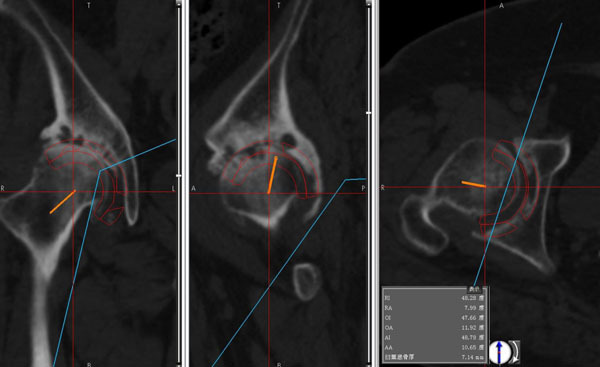 The accuracy of the computer navigation system was validated by comparing the angles shown on the postoperative CT images with the computer navigation measurements taken during surgery based on the ACA coordinate system. Some osteophytes were assumed to have been removed at surgery. It was impossible to detect the ACA plane because of the reaming procedure and the implant halation on CT images taken after surgery. Therefore, the virtual implant model was located on the CT image taken before surgery with reference to the same position shown on the CT image taken after surgery. The inclination and anteversion angles were measured using the CT image taken before surgery on the basis of the ACA coordinate system (Figs. 3 and 4). These angles were measured 3 times by 1 examiner (H.W. ), and the average was adopted. Virtual cup model was located in the CT images after Fig. (4) and before Fig. (3) surgery. All calculations were performed using JMP® version 10.0.4 (SAS Software, Cary, NC); the significance level was set at P <0.05. Using a paired t test, 2 comparisons were performed: one to analyze the effects of the osteophytes and the other to analyze the accuracy of the navigation system. Multiple regression analysis using the stepwise method was also performed. The independent variable was the absolute value of the difference of the cup position based on the ACA coordinate system (angles on CT images after surgery minus angles indicated by the navigation system). The dependent variables were as follows: sharp angle, acetabular angles with osteophytes minus those without osteophytes, and cup angles indicated by the navigation system. One iliac fracture occurred because the tracker pins were inserted into the anterior portion of the ala of the ilium, but it healed uneventfully. No dislocation of the hip joint occurred during the THA or during the follow-up period of more than 6 months. For the acetabular angles measured with osteophytes, the average RI was 51.0° (range, 38.9°- 66.8°; SD, 8.1) and the average RA was 17.0° (range, 6.9°- 35.0°; SD, 6.9). For the angles with assumed removed osteophytes, the average RI was 52.5° (range, 35.0° - 70.7°; SD, 9.3) and the average RA was 15.9° (range, 4.0° - 28.6°; SD, 6.8). The paired t test showed that the average values for the 2 measurements did not differ significantly. The average RI was 34.6° (range, 21.7°- 48.4°; SD, 8.3), and the average RA was 14.9° (range, -10.0°to 38.5°; SD, 12.5). Based on the ACA coordinate system, the average inclination angle indicated by the navigation system was -19.9° (range, -41.8°to 3.2°; SD, 11.5), while that indicated on the CT images after surgery was -16.4° (range, -40.0° to -4.3°; SD, 8.9). The average anteversion angle indicated by the navigation system was 3.8° (range, -9.4° to 18.0°; SD, 8.6), while that indicated on the CT images was 2.3°(range, -12.1° to 14.0°; SD, 8.1). The average difference (CT minus navigation) in inclination was 3.4° (range, -8.2°to 15.1°; SD, 5.3), and in anteversion, -1.4° (range, -8.4° to 4.3°; SD, 3.1). 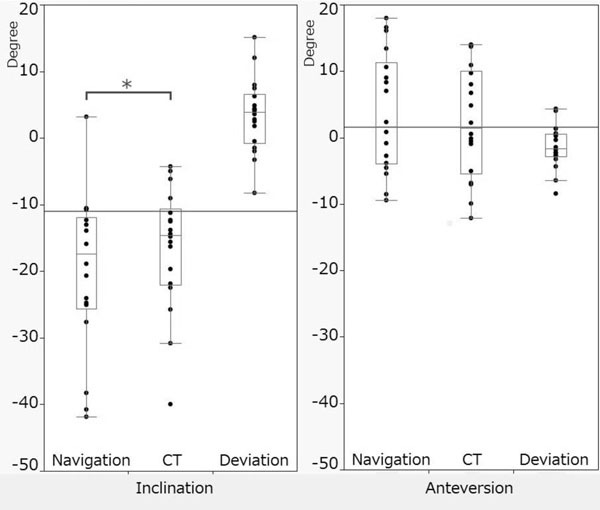 The paired t test showed that the average inclination angle indicated by the navigation system was significantly inferior to that indicated on the CT images after surgery (Fig. 5). Multiple regression analysis using the stepwise method showed that the difference in inclination correlated positively with the cup anteversion indicated by the navigation system and negatively with the acetabular anteversion (with osteophytes minus without osteophytes) (P=0.0004, R2=0.65). In short, the difference in inclination was large when the anteversion was larger than the ACA plane, and large anteversion was anticipated after removal of osteophytes. A significant regression equation was not obtained for the difference in anteversion. In this study, the angles of the acetabular cup based on the APP coordinate system varied greatly, and anteversion in particular differed among individuals. Fujii et al. defined the acetabular tilt as the angle between the APP plane and the line connecting the center of the acetabular rim with the center of the acetabular notch. They reported that a posteriorly rotated acetabulum (increased acetabular tilt) was associated with increased acetabular anteversion. Using the acetabular rim as the reference for the positioning of the cup, we placed cups in patients who each had various contours of the acetabular rim, including DDH. The morphology of the acetabular rim and the iliac tubercle with DDH patients need to be studied in the future. The positioning of the cup is considered to be critical for the outcome of THA [21, 25]. Moskal et al  reviewed the literature and concluded that navigated THA has significantly more safe placements and fewer dislocations than does conventional THA. However, the ideal reference for the cup orientation is controversial. Lewinnek et al  defined a radiological safe range of the cup position as inclination of 40° (SD, 10°) and anteversion of 15° (SD, 10°). And Widmer et al  advocated combined anteversion of the cup and the stem. However, McCollum et al. reported that the orientation of the femoral component is less critical than that of the acetabular component. There is a very small target zone for the optimal cup position for avoiding dislocation. Biedermann et al. suggested that there is no safe range for the cup position. Numerous factors influence the rate of dislocation after THA, and soft-tissue imbalance is thought to be one of the main causes of dislocations . Biedermann et al. stated that 81% of the dislocations in their study occurred within 2 months of THA. In the current study, however, 50% of the cases (9/18 hips) were outside the “safe zone”as defined by Lewinnek, and no dislocation occurred within 6 months of surgery. Average inclination (A) and anteversion (B). Navigation: the values indicated by the navigation system; CT: the values indicated on the CT images after surgery; Deviation: the difference between those 2 values. *P < 0.05. Vandenbussche et al. reported that anterior cup overlap with the acetabular rim after THA caused chronic friction between the iliopsoas tendon and the cup rim. Therefore, accurate positioning of the cup in relation to the acetabular rim may be preferable. Our placement of the cup was based on the acetabular rim, and we also considered the pelvic tilt in the standing position in several cases. Therefore, the angles of the cup may have varied and deviated from the “safe zone” in several cases. Future study on the pelvic morphology, including DDH, in relation to the ACA and APP is required. Fujii et al  postulated that the acetabular rim in DDH occasionally has a growth disturbance of the anterior ramus of the lunate surface (the front portion attached with a transverse ligament). However, we registered the rim profile based on the posterior ramus of the lunate surface. Recently, the contour of the acetabular rim has been analyzed precisely and was revealed to have 3 peaks and 2 troughs [30-32]. The 2 troughs are roughly equivalent to the anterior and posterior margins in the THA ACA® navigation system [31, 32]. If those troughs are taken into consideration, the chance of confusion due to osteophytes may be greatly reduced (Fig. 6). Richolt et al  demonstrated that precision of 10° is necessary for a clinically significant outcome . In previously reported studies of imageless navigation systems, when the measurements of the imageless navigation system were compared with those of the CT images, the mean deviation in the degree of inclination was 0° to 6.6°(SD, 1.9°- 7.6°), and the mean deviation in the degree of anteversion was 0.03° to 11.6°(SD, 1.6°- 7.6°) (Table 1) [1, 3, 6-12, 15-17, 35, 36]. The accuracy of the registration was thought to be influenced by the subcutaneous tissues overlying the anatomic landmarks. In comparison with those results, the results of the current study were good, despite being based on the ACA coordinate system. 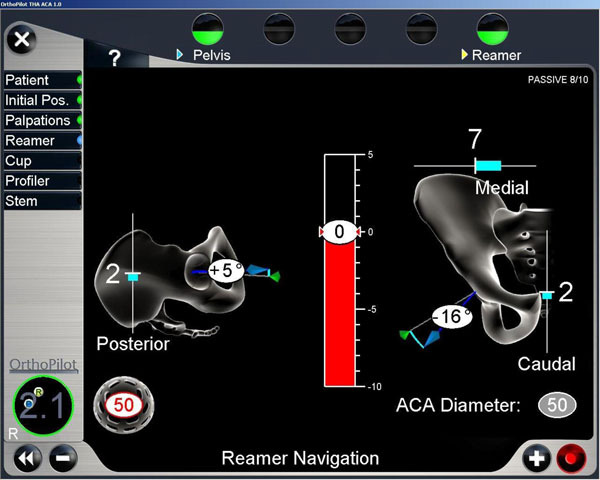 Although the THA ACA® is based on the acetabular rim which is smaller target than APP, we can readily access the anatomic landmarks, and ACA system is more precise than the system based on the APP . Good results were obtained even in retroversion and DDH cases [13, 14]. However, patients with highly degenerated acetabular rims may not be eligible for surgery with the THA ACA®. DDH is common in Japanese patients receiving THA . In the current study, no significant difference was found between the angles of the acetabular rims with osteophytes and those without osteophytes, despite a high percentage of the patients having DDH. Because the acetabular inclination of DDH is large [24, 37], the target for the cup inclination may be decreased from the ACA plane. The results of multiple regression analysis indicated that the deviation in cup inclination increased when the cup anteversion displayed by navigation was large and that acetabular anteversion without osteophytes was expected to be larger than that with osteophytes. In other words, the cup inclination with the navigation system was smaller than the true value (measured on the CT images) in patients with large acetabular anteversion and large anterior osteophytes. Therefore, presence or absence of anterior and posterior osteophytes may have an influence on the accuracy of the navigation system in relation to the inclination angles (Fig. 6). And the errors produced by this system may be a combination of errors of registration, landmark identification, and tracking devices. Overview of the literature investigating the position of the acetabular cup using imageless navigation systems. The ACA of the navigation system might abduct more than the true ACA, and the deviation in the cup inclination was increased in the case of large anteversion and insufficient removal of large anterior osteophytes. Frontal (A) and lateral (B) views. One of the limitations of this study was the absence of reliable measurements using the CT images. In recent studies, the CT-based cup evaluation method represents the most contemporary method of measurement and is increasingly accepted [1, 3, 6-17, 35, 36]. However, the extent of osteophyte resection depends on the judgment of the surgeon at the time of surgery. According to the degree of osteophyte resection, the predicted ACA plane in a CT image may differ from the perioperative ACA plane. And it is hard to determine the CT density threshold of osteophytes. These measurement procedures should be examined in future studies. The angles of the acetabular rim with osteocytes did not differ significantly from that without osteophytes.The inclination angle measured with the THA-ACA®navigation system decreased by 3.4 ± 5.3 degrees and the anteversion angle increased by 1.4 ± 3.1 degrees in comparison with the respective measurements obtained on the CT images. Cup inclination may be shown as smaller than its true value in cases with large acetabular anteversion and large anterior osteophytes. We thank Ms F. Miyamasu, associate professor of English for Medical Purposes, Medical English Communications Center, University of Tsukuba, for her editorial assistance. Kalteis T, Handel M, Bäthis H, Perlick L, Tingart M, Grifka J. Imageless navigation for insertion of the acetabular component in total hip arthroplasty: is it as accurate as CT-based navigation? J Bone Joint Surg Br 2006; 88(2): 163-7. Moskal JT, Capps SG. Acetabular component positioning in total hip arthroplasty: an evidence-based analysis. J Arthroplasty 2011; 26(8): 1432-7. Sendtner E, Schuster T, Wörner M, Kalteis T, Grifka J, Renkawitz T. Accuracy of acetabular cup placement in computer-assisted, minimally-invasive THR in a lateral decubitus position. Int Orthop 2011; 35(6): 809-15. Wixson RL, MacDonald MA. Total hip arthroplasty through a minimal posterior approach using imageless computer-assisted hip navigation. J Arthroplasty 2005; 20(7)(Suppl. 3): 51-6. Honl M, Schwieger K, Salineros M, Jacobs J, Morlock M, Wimmer M. Orientation of the acetabular component. A comparison of five navigation systems with conventional surgical technique. J Bone Joint Surg Br 2006; 88(10): 1401-5. Jenny JY, Boeri C, Dosch JC, Uscatu M, Ciobanu E. Navigated non-image-based positioning of the acetabulum during total hip replacement. Int Orthop 2009; 33(1): 83-7. Fukui T, Fukunishi S, Nishio S, Shibanuma N, Yoshiya S. Use of image-free navigation in determination of acetabular cup orientation: analysis of factors affecting precision. Orthopedics 2010; 33(10 Suppl. ): 38-42. Kim TH, Lee SH, Yang JH, Oh KJ. Computed tomography assessment of image-free navigation-assisted cup placement in THA in an Asian population. Orthopedics 2012; 35(10 Suppl. ): 13-7. Wassilew GI, Perka C, Janz V, König C, Asbach P, Hasart O. Use of an ultrasound-based navigation system for an accurate acetabular positioning in total hip arthroplasty: a prospective, randomized, controlled study. J Arthroplasty 2012; 27(5): 687-94. Ybinger T, Kumpan W. Enhanced acetabular component positioning through computer-assisted navigation. Int Orthop 2007; 31(Suppl. 1): S35-8. Ybinger T, Kumpan W, Hoffart HE, Muschalik B, Bullmann W, Zweymüller K. Accuracy of navigation-assisted acetabular component positioning studied by computed tomography measurements: methods and results. J Arthroplasty 2007; 22(6): 812-7. Hakki S, Bilotta V, Oliveira JD, Dordelly L. Acetabular center axis: is it the future of hip navigation? Orthopedics 2010; 33(10 Suppl. ): 43-7. Hakki S, Dordelly L, Oliveira D. Comparative study of acetabular center axis vs anterior pelvic plane registration technique in navigated hip arthroplasty. Orthopedics 2008; 31(10 Suppl. 1): 27-30. Carcangiu A, D’Arrigo C, Topa D, et al. Reliability of cup position in navigated THA in the lateral decubitus position using the ‘flip technique’. Hip Int 2011; 21(6): 700-5. Dorr LD, Malik A, Wan Z, Long WT, Harris M. Precision and bias of imageless computer navigation and surgeon estimates for acetabular component position. Clin Orthop Relat Res 2007; 465(465): 92-9. Hohmann E, Bryant A, Tetsworth K. Accuracy of acetabular cup positioning using imageless navigation. J Orthop Surg 2011; 6: 40. Crowe JF, Mani VJ, Ranawat CS. Total hip replacement in congenital dislocation and dysplasia of the hip. J Bone Joint Surg Am 1979; 61(1): 15-23. Laborie LB, Engesæter IO, Lehmann TG, et al. Radiographic measurements of hip dysplasia at skeletal maturity-new reference intervals based on 2,038 19-year-old Norwegians. Skeletal Radiol 2013; 42(7): 925-35. Reynolds D, Lucas J, Klaue K. Retroversion of the acetabulum. A cause of hip pain. J Bone Joint Surg Br 1999; 81(2): 281-8. Imai N, Ito T, Suda K, Miyasaka D, Endo N. Pelvic flexion measurement from lateral projection radiographs is clinically reliable. Clin Orthop Relat Res 2013; 471(4): 1271-6. Murray DW. The definition and measurement of acetabular orientation. J Bone Joint Surg Br 1993; 75(2): 228-32. Fujii M, Nakashima Y, Sato T, Akiyama M, Iwamoto Y. Acetabular tilt correlates with acetabular version and coverage in hip dysplasia. Clin Orthop Relat Res 2012; 470(10): 2827-35. Kennedy JG, Rogers WB, Soffe KE, Sullivan RJ, Griffen DG, Sheehan LJ. Effect of acetabular component orientation on recurrent dislocation, pelvic osteolysis, polyethylene wear, and component migration. J Arthroplasty 1998; 13(5): 530-4. Widmer KH, Zurfluh B. Compliant positioning of total hip components for optimal range of motion. J Orthop Res 2004; 22(4): 815-21. McCollum DE, Gray WJ. Dislocation after total hip arthroplasty. Causes and prevention. Clin Orthop Relat Res 1990; (261): 159-70. Biedermann R, Tonin A, Krismer M, Rachbauer F, Eibl G, Stöckl B. Reducing the risk of dislocation after total hip arthroplasty: the effect of orientation of the acetabular component. J Bone Joint Surg Br 2005; 87(6): 762-9. García-Cimbrelo E, Munuera L. Dislocation in low-friction arthroplasty. J Arthroplasty 1992; 7(2): 149-55. Vandenbussche E, Saffarini M, Taillieu F, Mutschler C. The asymmetric profile of the acetabulum. Clin Orthop Relat Res 2008; 466(2): 417-23. Cobb J, Logishetty K, Davda K, Iranpour F. Cams and pincer impingement are distinct, not mixed: the acetabular pathomorphology of femoroacetabular impingement. Clin Orthop Relat Res 2010; 468(8): 2143-51. Köhnlein W, Ganz R, Impellizzeri FM, Leunig M. Acetabular morphology: implications for joint-preserving surgery. Clin Orthop Relat Res 2009; 467(3): 682-91. Richolt JA, Effenberger H, Rittmeister ME. How does soft tissue distribution affect anteversion accuracy of the palpation procedure in image-free acetabular cup navigation? An ultrasonographic assessment. Comput Aided Surg 2005; 10(2): 87-92. Fukunishi S, Fukui T, Imamura F, Nishio S. Assessment of accuracy of acetabular cup orientation in CT-free navigated total hip arthroplasty. Orthopedics 2008; 31(10): 10. Fukunishi S, Fukui T, Nishio S, Fujihara Y, Okahisa S, Yoshiya S. Combined anteversion of the total hip arthroplasty implanted with image-free cup navigation and without stem navigation. Orthop Rev (Pavia) 2012; 4(4): e33. Jingushi S, Ohfuji S, Sofue M, et al. Osteoarthritis hip joints in Japan: involvement of acetabular dysplasia. J Orthop Sci 2011; 16(2): 156-64.